The Best Picture in The World. Here it is . . . the new projector that takes brightness to a completely different level! The amazing ILA-12K delivers an unprecedented 12,000 lumens of light output that leaves all other large screen projectors far behind.Brightness isn't the only story. The ILA-12K also produces a contrast ratio of 1000:1 and bandwidth of 150 MHz. And it's compatible with a wide range of sources including the new 1920 x 1080 HDTV standard, high resolution graphics to 90 kHz, and NTSC and PAL video. You won't believe your eyes in even the most demanding applications, including Cinema Screening Rooms, Outdoor Displays, Theme Parks, Arenas, Auditoriums and Entertainment Events. 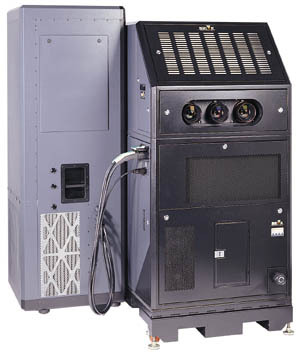 The ILA-12K is part of the complete product line of high-performance, ultra-bright Image Light Amplifier projectors. ILA® technology helps all Hughes-JVC models deliver an unparalleled combination of color, contrast, brightness, resolution and bandwidth for the most incredible large screen image in the industry. Size (HxWxL) 72.5" x 56.0" x 58.0"
Brightness and contrast measured at 1024 x 768, 90Hz, 5600°K. Specifications subject to change without notice.